The eleventh annual Stony Brook Human Evolutionary workshop gathered scientists from all around the world to Turkana Basin Institute’s (TBI) Turkwel research facility on August 21st-26th 2012. Workshop was assembled to discuss the role of Geographical Information Systems (GIS) in the area. Virtually all the fields of research supported and facilitated by the Turkana Basin Institute, ranging from palaeontology to modern ecology, have a spatial component, and use GIS in their studies. The workshop was opened with welcoming words and introductory speech by Richard Leakey (Stony Brook University) and Lawrence Martin (director of TBI). Jason Lewis (Rutgers University) acted capably as a chair for the workshop, and moderated the open dialogue. Over the next five days participants discussed the role of spatial information and analyses for the various fields of study, and planned the establishment of a collective research and public domain GIS database for the Turkana Basin. 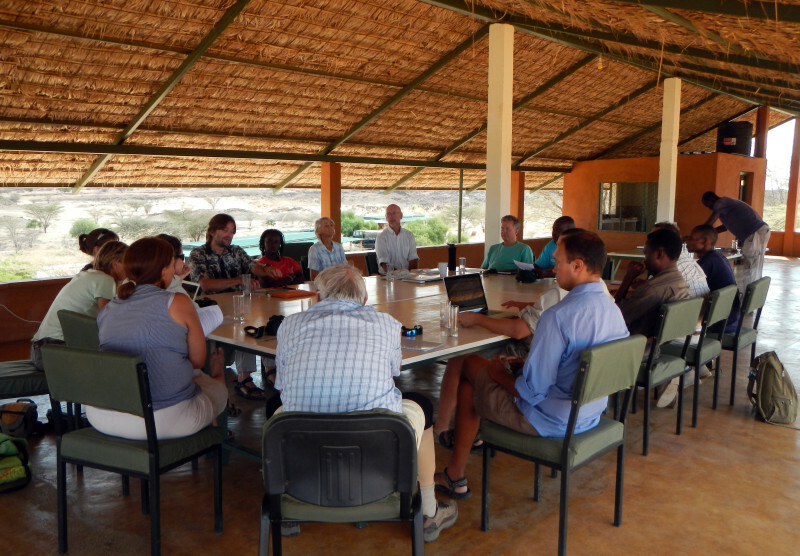 Scientists gathered at the eleventh annual Stony Brook Human Evolutionary Workshop at TBI-Turkwel. Photo credit: Oula Seitsonen. Conversations about the general needs and desires for GIS data and databases evolved as spontaneous considerations along a casual work plan prepared by Lewis. Besides database planning, also themes connected to collecting of spatial data, such as digital documentation equipment, were touched based on recent field experiences. In the future TBI will uphold and improve its geospatial documentation hardware and software pool offered to associated researchers. Workshop was successful in agreeing to commence the planning, designing and eventually building of a general Turkana Basin Geodatabase hosted by TBI. This will allow researchers working in the area to effectively plan, perform, record, curate, and ultimately share their work with other researchers and wider public. There is a vast amount of existing research data from the area ranging over millions of years in time scale, which should be collected and cross-referenced. The overall aim will be that the Geodatabase promotes collecting and recording geospatial data in an approved format, and allows spatial analyses and visualization of this data on a common online platform. TBI will also provide secure and centralized storage for the projects’ data, starting from scanned field notes to finished publications. Turkana Basin Geodatabase will also permit researchers open access to pooled geospatial sources, such as satellite imagery, geo-referenced aerial imagery, and other kinds of data from public and private sector providers. As evening entertainment the workshop participants gave informal presentations of their own GIS related studies. For instance, Jason Lewis presented his remote sensing analyses and promoted the use of satellite data for geological analyses in the Turkana Basin, and Caren Herbert told about the GIS applications from the viewpoint of Tullow Oil working in the area. Oula Seitsonen (University of Helsinki) also described the phase of extensive geo-referencing work carried out by the University of Helsinki and the TBI Nairobi office of the aerial photographs in which all fossil find locations from 1968 to 2000 were originally marked as pin holes. In a closing, the workshop participants agreed that there is a demand for a centralized online spatial platform accommodated by TBI. Eventually the Turkana Basin Geodatabase will become single integrated data storage and analysis environment for all researchers, and also a search and visualization engine for the general public. This will allow advanced promotion of various fields of research carried out in co-operation with the Turkana Basin Institute, for both the worldwide research community and public audience.